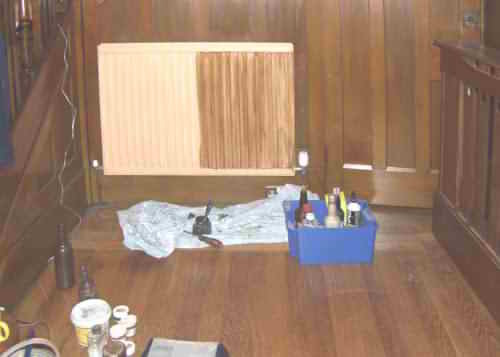 Why do you want to cover up your radiators? Because they are ugly. So why not change the radiators? That way you could continue to hang up your washing on them! Well, that's what I did in my own home. 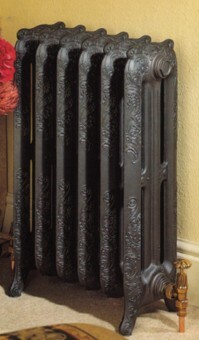 The cast iron “Liberty” radiators (below at the right) are only a little more expensive than covers, although there is also the cost of installation not to mention disruption. If I have talked you into changing your radiators, fantastic, or do I mean damn it? We don't supply them, so I've lost your business. As I understand it, you don't like the look of your radiators and are willing to spend good money to hide them. You are also willing to put lumps of MDF around your radiators, letting it absorb the heat that you are paying gas bills to generate. The deduction is elementary: you are prepared to buy beauty. You are a true aesthete. Art for art's sake should be your motto. So why is it that you, sensitive artistic soul, even consider the common or garden radiator covers? Oh, yes, if you buy one from B&Q or the Argos catalogue it will be cheap. But can you possibly find the mass-produced monotonously identical look reassuring? You wish to hide your radiators because they are not attractive but are prepared to do so with a piece of hideousness? Have nothing in your home that you do find useful or believe to be beautiful. 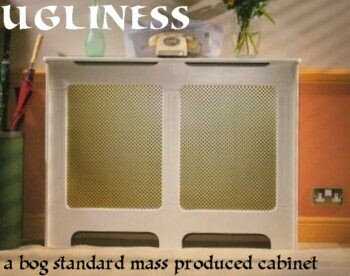 The mass-produced radiator cover is neither useful nor beautiful. So don't have it in your house! Let's cut to the chase. How much will it cost you? We have a page for you to calculate the cost, but our base price is £330, including measuring, staining, varnishing, delivery, fitting, painting radiator and VAT. Collect and fit it yourself and save £45 for each cabinet. You will probably have to fit it yourself if you live too far outside Glasgow -- we don't like to travel. But we can organise delivery to you, even in deepest England. For courier delivery expect to add a one-off cost of about £50 (alas, no discount for diy fitting of courier delivered cabinets). 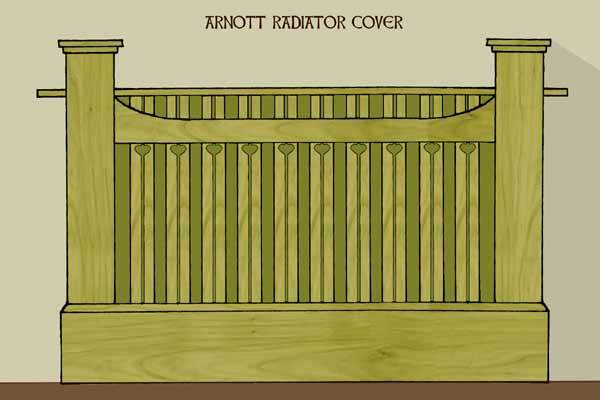 There are minor extra costs for radiators over 1.3m, for staining (antique, jacobean or mahogany) or painting, and for little extras, such as thermostat access or vents in the top shelf. When we fit you radiator cover, we scribe it to the wall. That is to say, we cut out the shape of your skirting boards on the cover and we plane the back edge of the shelf so that it follows your wall, even if the wall is quite uneven. The end result is a snug fit with only small gaps around the edges. But we also paint your radiator. Not just paint it to match the colour of the radiator cabinet, we also add some graining effects. Here you see a radiator that has already had an undercoat of emulsion. The next coat, here in shellac, is adding to the colour and creating streaks to mimic grain. Finally, there will be a coat of polyurethane varnish with colour added to match the colour even more closely. Our radiator cabinets are absolutely made to measure (the shelf will be about 80-90mm above the radiator, however high or low it has been mounted on the wall). They are not simply adjustable or come in several sizes, they are made to fit your radiator exactly. We can accommodate tight corners, odd sizes, nearness of window sills and door facings, access for thermostats or electrical sockets. We make the radiator cabinet's skirtings high enough to hide the bottom of your radiator (so you don't see your own, usually shiny white, skirting boards through the slates). Notice that the two radiator covers at the top of this page are very similar, but the size of the skirtings are quite different. For those who worry about heat loss, we can lag the underside of the shelf (which absorbs some of the heat) or insert brass or chrome grilles in the shelf to let out the heat trapped under the shelf more readily. Because they are handmade and completely bespoke, our covers are not cheap. And, what's more, even the design is bespoke. Yes. We offer bespoke designs. Until recently we have not charged for designing something to go with your furniture or the period of your house. However, this has proven to be business folly. 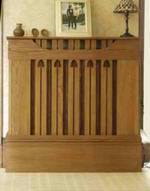 The "Japanese" radiator cover, the "Art Deco" cabinet, and this one here have all been abandoned by the fickle customer. When we say we offer bespoke designs, we really mean that you can either come up with your own crazy design or fiddle about with some of our own minor details, such as the cut-outs in the slats. 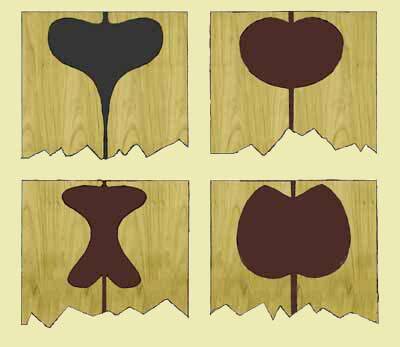 You can have no cut-outs or hearts or variations on hearts. You could have squares but we would rather you took circles; you can also have diamonds but you really should just stick to hearts. I started to make up a set of drawings of the cut-out variations we offer and, if I live to be very old, I may finish this project. Mostly we use upside down hearts or "tulips". 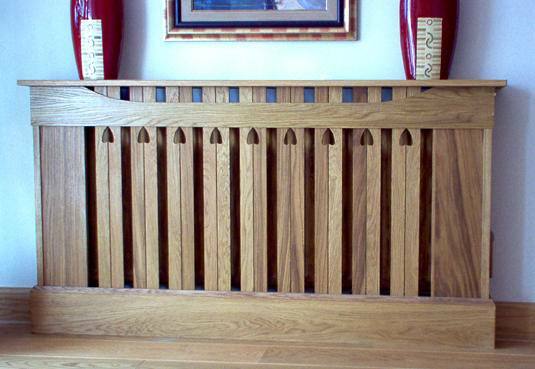 On the rare occasion the repertoire is enlarged, the reason is usually that someone has furniture or staircase spindles with cutouts that we are trying to match. You'll see more if you go to the gallery page. Since the closure of the old Kodak Processing Factory on the Clyde, we no longer have radiator covers on show publicly. We have one or two in the workshop (an old chicken shed near East Kilbride) if you wish to come see them. And just occasionally (once every two years! ), we take one to a show at the SECC. *Covering a radiator cuts down its heat output, end of story. 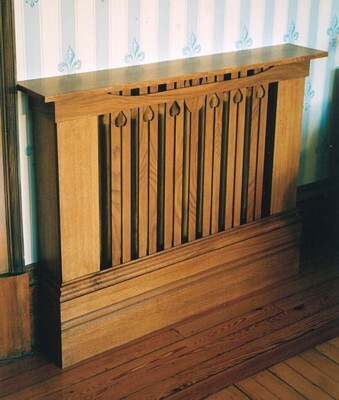 We make radically different radiator covers to the mass produced variety. We pay little attention to the conventional designs of our competitors and try to make our covers look like art while allowing them to do their job. To start with, we leave your radiator as open to the room as possible. The average commercial cabinet grille is no more than 30% open and 70% screened, whereas ours are about 60% open and 40% screened. Other manufacturers make the ludicrous claim that by building up heat behind behind the screen (and sucking up cooler air from below) the heat is convected through the top slit and shoots out into the room instead of rising to the ceiling, making the radiator work more efficiently. Rubbish. Radiators radiate heat to the air around them. The heated air circulates much the same way with or without a cover (i.e. it mostly rises), but the cover itself, particularly the shelf, will absorb some of this heat from the air (and waste energy you are paying for). If manufacturers were really interested in preventing heat loss, they would coat the inside of their cabinets with a heat reflecting material. We offer to insulate the underneath of the shelf at a price of £15. (We estimate that it will take about six years of use before this option is economically and environmentally sound.) Alternatively (or additionally?) we will fit a grille to the top shelf. This will let the heated air out much more quickly, lowering the temperature of the air inside the cover. Much less heat will then be lost by being transferred to the MDF shelf. Although £30 each, the grilles are attractive as well as energy saving. A smaller brass version is available at a third of the price. But the least expensive alternative is to have a tulip shape cut out of the top shelf. Children will enjoy posting pens and keys down this hole!